There was quite a lightning show yesterday. The thunder was so loud that it shook the building. I worried all day about my cats, imagining them shivering in fear under the bed while I was stuck in my office wishing I had a better view of the sky. I was not so worried about Riley, my dog. He's rather fearless even if excitable. After I got home from work and had settled in, the thunder and lightning came in quick succession. Riley started barking and chasing the cats who were trying their hardest to reach the bedroom and their safe place. This was the first time he had ever really reacted to the thunder. I sat him down and explained that it was nothing to get excited about, just the gods bowling. Even they need to take time out and play. Perhaps Riley actually understood what I was saying, but the truth is he probably hadn’t a clue. More than likely it was my tone of voice, body language, and my stroking of his back that did the trick. But I'd rather think it was the story. I cannot remember if it was my grandfather or father who first told me the story about the gods with their bowling balls: the thunder being the sound of the ball striking the pins and the lightning being the celebration that follows. Maybe you’ve heard the story too? It's one that calmed the nerves of a frightened child. But what if it weren't the gods who were bowling, but angels? I can see it perfectly in my mind's eye . . .
Brianna (Bree) Winston-Beaufort is striking out on her own, having inherited her eccentric uncle's law practice in Savannah, Georgia. She could not be more excited: it’s an opportunity to prove herself and to move away from her well-meaning but overbearing parents. Unfortunately, her uncle's law office fell victim to fire, and so Bree is forced to find a temporary working space during the renovation process. She finds a house on Angelus Street that is too good to pass up. The price is right and the landlady, Lavinia, won't take no for an answer. The catch? Her new offices are located in the middle of a cemetery. And not just any cemetery. It is a murderers’ cemetery where the bodies of murderers have been buried. 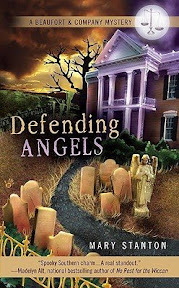 In Defending Angels, Bree sets up office, hires staff, rescues a dog, and takes on her first client. She's been hired by the assistant of a recently deceased, extremely wealthy businessman to prove that his death was no accident despite evidence to the contrary. Bree is more than skeptical of her client's allegations, especially when she learns the client says she knows it was murder because the man's ghost told her so. Still, the former assistant is her client, and Bree must represent the client's best interests. Bree turns on her Southern charm as she looks into the possible murder of the businessman, Benjamin Skinner. The more she digs, the more she begins to believe her client may just be right. And soon it isn't just her temporal client she is representing, but Benjamin Skinner himself, who is facing serious charges in a very different type of court, the Celestial Court. It's impossible for Bree to ignore the strange things going on around her. Ghostly white faces that appear in her window, a horrid painting that has a life of its own, and staff that seem to have unearthly—dare I say, angelic—abilities. And what of Gabriel Striker, the private investigator who always shows up just when trouble is brewing? Bree quickly learns that there is much more to the law practice she inherited from her uncle than it at first seemed. She may not represent the most innocent of clients, but even they deserve a fair and just attorney on their side. Bree manages to maintain her head through it all (although there are moments when she doubts her own sanity). I really liked how the author, Mary Stanton, kept the reader in the dark and just as confused at times as Bree. As Bree learns and adjusts to her new life situation, so does the reader. Bree's focus on the task at hand certainly is, in part, what keeps her moving forward. The narrative is witty, fast-paced, and, of course, entertaining. I enjoyed the time I spent with Bree and her family and friends, and even getting to know her ex-boyfriend, Payton the Rat (who has well earned that name). Sasha, Bree's dog, will quickly win over the hearts of readers. I couldn't get enough of Bree's sidekicks, Ron and Petru. And I'm dying to spend more time in Lavinia's room upstairs. I did not hesitate to jump right into Angel's Advocate upon finishing Defending Angels. In the second book of the series, Bree's aunt asks her to take on the defense of a rather unruly teenager, Lindsey Chandler, who assaulted and stole the money of a Girl Scout. Bree isn't sure how she can help--or if she'll be able to do much for the child, but she agrees to at least give it a try. As it turns out, someone else needs her assistance as well. Lindsey's father died in a car accident four months before. Probert Chandler was a man who had lived a modest life despite his wealth. He had been found guilty of serious charges in the Celestial Court, however, and had filed for a retrial and Bree is his designated attorney. Bree has her hands full. Lindsey is out of control, and her mother does not know what to do with the child. Not to mention the long list of suspects who may be embroiled in some sort of trouble related to Mr. Chandler and his business. And does it relate to Lindsey and all the trouble she manages to find her way into? Bree has quite a knot to untangle in order to find the truth. If that wasn't enough, it appears two bodies have disappeared from the cemetery surrounding Bree's office, and the murderers' spirits are out to stop Bree. Someone isn't happy she picked up where her uncle left off. 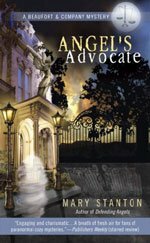 Angel's Advocate was just as exciting and fun as the first book in the series. The reader is reacquainted with old characters and meets a slew of new ones, each of them interesting. I could just picture Belli and Miles, Bree’s most recent guardians, crammed into the back of Bree's car everywhere she went. And, of course, I was happy to see Sasha by her side. In preparation for writing this series, the author did extensive research into the subjects of angels and early Christianity. The foundation of the Beaufort and Company series is built loosely on 11th and 12th century medieval theology, which was influenced by the world's major religions of the time: Judaism, Christianity and Islam. The author also drew on Chinese religions as well. I found this especially fascinating and admit it makes the series even more appealing to me. Mary Stanton has created an intricate and detailed world that I am looking forward to exploring further with each novel. Bree has an interesting back-story that is threaded throughout each of the novels and most likely will continue in future books. So, while each book can stand well on its own, there are personal story lines that carry over and might be best read in order. Despite the somewhat frivolousness of the novels, they do have a darker side. The more I delve into the "cozy" sub-genre, the more I am discovering how wrong my early conceptions were. Charlaine Harris, Clea Simon and now Mary Stanton are among the authors who have shown me the light. I like edge to my mysteries and The Beaufort and Company mysteries certainly contain that. Check out Mary Stanton's website for more information about her and her books. And if you haven't already, take a look at my interview with the author. Oh my, the last thing I want is start yet another series, but I don't think I have any choice now. These sound absolutely wonderful. And original. Yep, your fabulous review has made these impossible to resist! Especially since I think I carry around that same misconception that you did about cozy mysteries. I like an edge, too, so it sounds like I need to spread my wings a bit and see what's really out there. Hmmm...this one sounds very much like my cup of tea. On the list it goes! Oh, and FYI - it's been my experience that once a dog starts reacting to thunderstorm they keep reacting to thundrstorms. My Riley wasn't bothered by them at all until last year. Now she tries to find a place to hide. I hate being at work when we have one for that reason. Oh, I forgot to mention - my parents told us the 'God is bowling' story too! Stop by my blog for a couple of awards! I love your grandfather's bowling story. Hopefully Riley is soothed. Hopefully the lightening is over. Bad time of year for it. This does sound like a good series! I couldn't think of her last name at the bookstore last night. We didn't get much of the thunder and lightning out our way, which is just as well - Gypsy doesn't like it either, which is one reason it's better for her out here than it was in Tennessee :-). We were told it was angels (not gods - I grew up Catholic) bowling - and a really loud thunderclap meant one of them just got a strike :-). If I ever decide to step out of my "I don't read genre" box, your reviews give me lots of good ideas about what to check out, Wendy - and this is one of them. Thanks! Cosy's have moved on from the little old ladies/men with faithful cat/dog at their side. I really enjoy the genre especially the ones with a supernatural edge. This book sounds so good. Of course it had me at the quote you used right off. I need to get into reading more cozies. I haven't lately and I'd like to. On the topic of storms I've always been lucky that Buddy isn't scared although he will bark at the thunder. I'm always calm so he's calm. I feel sorry for them though and would worry just like you if they were home alone. Hi Wendy, now I can tell people that "God is bowling" too! LOL! That's a great review and I love the quotes! Sandy - I think the author has a great sense of humor too, Sandy. I think you might like this series. :-) I really like thunderstorms too--I wish this one has produced more rain though (and lasted longer). Debi - Haha! I know what you mean. It's not like I need to add another to my list of series that I'm involved in either. I don't like being away when a storm like that hits either. Poor kitties. My Riley hasn't shown signs of fear yet--other than getting excited. It will be interesting to see if that continues. Avis - Thanks so much! Carrie K - It's a cute story, isn't it? It helped me get over my fear. I heard on the news that a woman was struck by a bolt of lightning in the area and died. So sad. Growing up, the thunder scared me more than the lightning. Noise over real danger. Florinda - I don't remember the thunder being quite so loud and frequent in this area before--at least not while I've lived here. Ah ha! So the angels do bowl too! I can just picture it too. Iliana - I generally have to be in just the right mood to fully appreciate a cozy. I've been lucky to find some good ones that have a little edge to them. I will be interested to know what you think of this series if you do give it a try. Diane - That's some library, isn't it? Dar - I wish the reader had more of a chance to spend in that library . . . This is the first time Riley's barked at the thunder. I hate seeing the cats so scared. They finally did come out from under the bed, but they were a little jumpy after that. I worried about them while I was at work when we had that first set of thunder claps. I wished I could have come home to check on them. Alice - LOL It's a fun story, isn't it? I feel the strong need to read this series now!!! Thanks Wendy for making this one that I can't resist!!! I loved your review and story about the gods bowling. Yes, I had heard this as a child, but not from my parents. It is comforting to think this way though. My dog Mystery gets very nervous during storms. Your story about your fur kids made me chuckle. I can just picture the scene. A great book for kids that is by Patrica Polacco is Thundercake. The grandmother of a little girl calms her nerves by making a cake during the time it takes for the storm to arrive. At the end of the book they include the recipe. It's a great picture book for kids and lends itself to a great read aloud. Thanks again for a fabulous post today. Staci - I hope you do give it a try, Staci! Donna - Thank you! Thundercake sounds like a wonderful book. I wonder if my mom has heard of it. It might be a good one for her class. Nope haven't heard that one but cute story! For some reason this reminds me of The House on Tradd Street and I bet it's just as good! I'll have to see about picking up a copy asap. Jen - I think you would like this series, Jen. I hope you are able to read it.